Gypsy war der Erfolg für Jack Klugman. In jeder Hinsicht. Ohne Gypsy hätte er seine Rolle als Oscar in Männerwirtschaft nicht bekommen. Lange dachte Jack Klugman, dass er sein Engagement für die Rolle des Oscars dem Theaterstück "Männerwirtschaft" verdanke. Und zwar als er Walther Matthau auf der Bühne ersetze. Dem ist nicht so. Garry Marshall der Produzent sah ihn in "Gypsy". 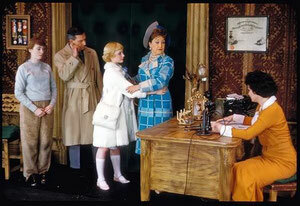 Bild Sandra Church, Jack Klugman, Lane Bradbury, Ethel Merman und Peg Murray. "Gypsy" ist ein Musical, das zum ersten Mal 1959 - 1961 am Broadway aufgeführt wurde. Dabei spielte Jack Klugman die männliche Hauptrolle. "Gypsy" gehört zu den erfolgreichsten amerikanischen Musicals überhaupt und wurde zu einem der größten Broadway-Kassenschlager aller Zeiten. Es wurde nach den Memoiren der Striptease-Tänzerin Gypsy Rose Lee verfasst, die durch ihre Varieté-Auftritte berühmt geworden war. 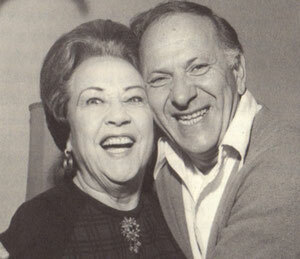 Jack Klugman spielte den Freund von Gypsy's Mutter, die vom Musical-Star Ethel Merman gespielt wurde. Jack Klugman sagte immer scherzhaft in jedem Interview, dass er den besten Platz hatte... auf der Bühne. Er liebte es, wenn sie für ihn sang. The last musical comedy of the season turns out to be the season's best. As a production, "Gypsy" hangs together with professional ingenuity and gives Ethel Merman something responsive to work with. Since she acts the part of a woman of indomitable personality, she gives an indomitable performance both as actress and singer. The casting is perfect. Not since "Annie Get Your Gun" and "Call Me Madam" has she played a character of such concentrated vitality. Arthur Laurents' libretto is based on Gypsy Rose Lee's autobiography, "Gypsy," published by Harpers two years ago. Miss Merman plays Gypsy's mother, a woman of fanatical singleness of purpose who is currently celebrated in another autobiography by Gypsy's sister, June Havoc, "Early Havoc," published by Simon and Schuster. The original family name was Hovick. When Mrs. Rose Hovick was forcing her two small daughters on vaudeville audiences all over the country in the Nineteen Twenties, she was apparently ruthless to a degree that was not funny. According to Gypsy, the Hovick tribe always left behind a number of angry people who were probably angrier when they counted the sheets, towels, blankets and silver. In the musical comedy, this forbidding aspect of her personality is duly noted. But it is difficult to feel censorious about any character that Miss Merman absorbs into her unique blend of heartiness and drum-major singing. As Mrs. Rose, Miss Merman fights everyone for her two daughters during the most robust part of the evening, which is the first, and concludes the performance by fighting for herself. Her final number, a song written with dramatic versatility by Jule Styne, is a triumph for the character, the actress and the show. The curtain descends on Miss Merman's most dazzling moment. No doubt Miss Merman has learned a lot about the stage since she first startled the town by singing George Gershwin's "I Got Rhythm" in "Girl Crazy" way back there in 1931. But it is impossible to think about her in any terms except in her own -- a supremely self-confident woman with an oval face, popping eyes, a determined mouth, an alert manner of walking and standing, a sure sense of timing and a razzle-dazzle voice. She is not afraid of vulgarity. If there is something fundamentally comic about the character of Mrs. Rose, who cheats, cajoles and circumvents, it is because we know that the opposition is doomed, and that in her own way Miss Merman will save not only Gypsy's career but also the show. When the libretto begins to be affected in the final scenes, she brings it down to earth with a bang. In comparison with other books of the season, Mr. Laurents' is realistic and enjoyable. Most of it is an exuberant cartoon of smalltime show business in the Twenties and Thirties, when Hollywood was substituting sleek photography for the frantic routines of vaudeville. Under the direction of Jerome Robbins, all of the various departments of "Gypsy" come alive in the same style of slapdash amusement. Jo Mielziner has designed a production of nostalgic humors -- the garish stages of yesteryear, the slatternly dressing rooms and the gaudy stage spectacles. Raoul Pene du Bois' costumes reveal a carnival cheapness that is also comic. It was a dreary period for third-rate vaudevillians, and the gaiety of their big numbers was desperate. Nothing in "Gypsy" is funnier than the spurious archness of the vaudeville set pieces in which smirking children sing "May We Entertain You?" in shrill voices, a cow dances and the red, white and blue flamboyantly explodes at the finish. The appalling lack of taste is hilarious. Backstage at a strip-tease burlesque house is equally grotesque, especially when bored show girls with spears lazily file by in Roman armor. Without glamour, the symbols of show business are ludicrous, and the energy the performers squander on hopeless production ideas, parodies an era. Mr. Robbins, Mr. Mielziner and Mr. du Bois have developed this point of view with the relish of sophisticated showmen. Since "Gypsy" has a literate theme, it has put everybody on his best behavior. Mr. Styne has written his most colorful score. The music is fresh and lively in the musical-comedy tradition. Taking every situation on its own level, he has written dramatic songs, as well as Tin Pin Alley tunes. Stephen Sondheim's lyrics are equally hackneyed. The dancing is to the point. Although Mr. Robbins is a ballet master (he staged "West Side Story"), he has not indulged in self-conscious interludes of ballet symbolism. He has adhered strictly to the business of telling a pungent story in a convivial manner. All the peformers -- juvenile and adult -- make cheerful company. As Mother Rose's boy friend, Jack Klugman could hardly be better. He makes a disarming human being out of a colorless character. As Gypsy Rose Lee, Sandra Church is ideal -- a charming, aimless adolescent who grows into a cool woman of the world at the end. In her quiet style of acting Miss Church expresses remarkable strength of character. For "Gypsy" is a thoroughly professional musical. To a good theme it adds the spontaneity of a well-staged show. Nothing is stuck on. The enjoyment comes from the core of a professionally written script and score. And there is a topflight professional at the head of the cast. Miss Merman keeps the whole show terse and bright."